4 members of North Sydney made the journey to Canberra over the weekend of October 14-15 to compete in the 25m NSW Masters State Championships. Although only 4 people strong (we will hope for more next year!) it was a weekend filled with stories nonetheless. Here are the best four. Team minus one at the local (shearing shed pub) for dinner. Day 1 over with John as the shining star with three firsts. 1. Our youngest and newest member Rhys Hille came to Canberra while his brother flew in from Perth to also swim in the meet. Rhys had broken his arm shortly after the relay carnival and had not done much training over the winter. He did warm-up at the Pirates Carnival 3 weeks ago and even then could still do a 27. for a 50 free with a pretty appalling open turn (sorry Rhys). We could only imagine what he might be capable of with a proper flip turn and some more consistent training! So on Saturday, after Rhys reassured me he has been trying to get better at his flip turns, Rhys had a spectacular first 25m of his 100m, attempted a flip turn and then disappeared for about 4 seconds. When he finally re-appeared on the surface of the water, only 4m from the wall, he could only swim on and wonder what to do next. He still finished in a 1:07 and vowed to do better on day 2... with an open turn. On Sunday, Rhys had the fastest 50 free in the pool with a 26.56 and an open turn! Our message for Rhys – come back to training to work on your flip turns and you can work at breaking the club record of 24.71 that has stood since 1988. You only have until December 31st to do it though! 2. While we were quite excited to enter a couple of mixed relays at the swim meet – we would be just over the 200+ age group with Rhys as our weapon, we unfortunately missed the fact that we needed to notify MSNSW by Wednesday noon how many relays we were entering and pay for those relays even though we didn’t need to put names in until the day of the relays. Lesson learned and we have made a mental note not to make that mistake again. (MSNSW does not allow late entries under any circumstances:( even though we tried). 3. We had a mini-reunion with ex-North Sydney members. John, Helen, and I stayed with Kevin Porter (past coach) and Robyn Burton (still a competing member for us) in Murrumbateman. They are wonderful hosts and have a beautiful, 1-lane, 25m pool in their backyard that has all the FINA required standards if we had actually felt like swimming! Both Kevin and Robyn have had their own healthcare woes over the past month, but were marvelous hosts and came to the pool each day to cheer us on. 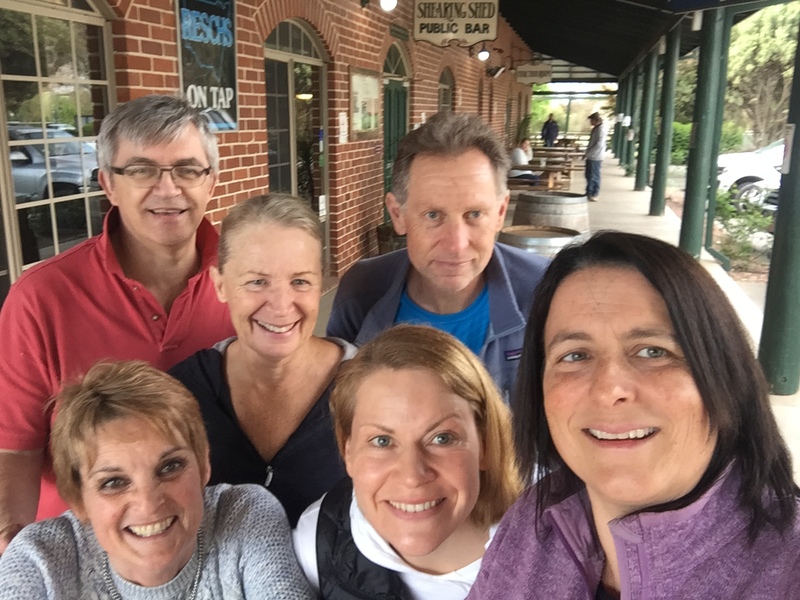 Additionally, Gillian O’Mara, another ex-North Sydney swimmer, flew in from Brisbane to compete and we had a great time catching up at the local pub over dinner on Saturday night. Socially, were were a team of 7! Our message for all... the more the merrier! Fun is in the numbers:). 4. The swimming of course! The meet ran very quickly with a late-ish start on Saturday finishing about 2:30pm and an early start on Sunday, finishing around noon. A couple of us even attended a coaching forum to review backstroke rules and few other tips on Saturday afternoon. Other than Rhys (already mentioned in #1), here is how our other 3 swimmers made out. (Full results will be viewable on the Results tab of our website in the next few days). Helen had not been feeling well on Friday and although she said she wasn’t going to swim on Saturday, she gave it a go anyway and pulled off a very reasonable 50 breaststroke winning 2nd place by just 2/10’s of a second. She followed up on Sunday with the 100 breaststroke and another 2nd place, this time with just over a second to spare. John DeVries.... well he just won everything he swam. Meaning he also won his age group with a maximum of 50 points (10 points for each first place, 5 swims total). He was actually complaining about not having enough competition, so we’d like to ask more of our own members in his age group to help him out! Christina was still making a tentative come-back from a shoulder injury that just won’t go away. It has certainly come a long way since January and although not 100%, she swam the 50 and 100 of both backstroke and breaststroke. The 50 speeds on Saturday were adequate, and after that warm-up, the 100 swims resulted in some quality times on Sunday. 3 of the 4 swims were first places, although the competition was very tight in all four events – resulting in 2nd place in one event. It was a good come-back anyway! Well that concludes this meet report. The ocean swimming season is upon us, but there are still a few more meets that you can participate in before the end of the year. Check out the calendar page of our website (http://www.northsydneymasters.org.au/calendar/ ) or the MSNSW website calendar here (http://www.mastersswimmingnsw.org.au/Competition/Events/Meet-Calendar). One meet still to come is the long-distance championships being held at Knox Grammar. This is one that even ocean swimmers might like to participate in just to assist with their conditioning and distance racing speed for the ocean. If you have never been to a competition and would like to give it a go (there are no standards – anyone can enter), just have a chat with some of the more experienced swimmers on the pool deck.